“A 600 pp monumental epic" ... Wait, scratch that. Length is intimidating in our blog bite times. "A captivating saga ... captures the sweep of South African history" ... Arggh. Language designed to appeal to Sales. It is also grossly inaccurate. And isn’t a Colleen McCullough-esque pitch wildly outdated? “Picks up where J. M. Coetzee and Nadine Gordimer left off." Wrong, wrong, wrong. Who lumps writers together merely because of nationality? Gordimer’s social realism and Coetzee’s (post)modernism are on different ends of the writing spectrum. Not to mention that both writers are still writing and neither have much in common with van Niekerk. "A marvel of interiority, linguistic and formal innovation." Hmmmm. Who in the post-video generation cares about interiority? And aren’t we venturing into pretentious Jonathan Franzen territory here? Gosh, we can’t alienate Oprah. Publicity will have my head. “Larger-than-life characters that inhabit a fully-realized world.” Do people want characters that are larger than life? Isn’t life-size more appropriate for our recessionary times? And what’s up with “fully-realized world.” Am I selling a book or a video game? “A masterful translation that captures the passionate lyricism of the original.” Wait. And the last time translation helped sell a book was ... What am I thinking?! “An inspiring story of a white woman in the terminal stage of ALS and a black maid handed the reins of self-empowerment. Two women suffocating within the lines that define their times, about to take an extraordinary step. Heartbreaking and true." Now we're getting closer! We'll leave out the bitterness, the irony, the main character's bitchiness, and anything resembling literary gravitas and we'll sell it like THE HELP! Bestseller-dom here we come. Sales is going to love me. This is not a true story. But it’s close enough. And it captures a dilemma that haunts publishing and the PEN World Voices festival -- even its most famous participants. For a large portion of the impressive panel PEN staged on Saturday featuring Nobel Prize-winning Toni Morrison, prize-winning South African author, Marlene van Niekerk, and moderated by Princeton professor Anthony Appiah, Morrison, a longtime Random House editor herself, seemed to fall back into editor-speak. 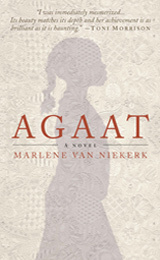 Morrison, whose combination of powerful elegance and impish humor always puts audiences both at ease and in awe, had already contributed a rave blurb for van Niekerk’s new book, Agaat, saying: “I was immediately mesmerized ... Its beauty matches its depth and her achievement is as brilliant as it is haunting.” At the event, she talked about “not being in a reading mood” when van Niekerk’s book first arrived, but being instantly drawn in. The first half hour was staged as a conversation but to a great extent consisted of Morrison’s explanation of and praise for van Niekerk’s stirring novel. Why so much time spent on such fulsome words from one of the most famous authors in America for a relative unknown? Agaat is indeed a revelation. But also because PEN World Voices wants to introduce Americans to more foreign voices. And Toni Morrison, who as a publishing veteran knows this game as well as anyone, was graciously -- and very generously -- determined to do her part. Did she succeed? Does PEN? It’s a question we all hope can be answered favorably. Spectators certainly show up for the famous American authors at PEN World Voices (the second half of the panel, the Q&A, consisted primarily of avid audience members asking questions of Toni Morrison, whose works they clearly knew and revered.) And the few international authors at PEN World Voices already known to Americans garner great attention. But much as audience members enjoy the contributions to panel debates or readings of the new foreign names they are introduced to, how many go home and order those authors’ titles on Amazon? And two months later, how many remember the foreign authors’ names? And two months after that, how many publishers renew their contracts for American editions? As someone who pushed early and hard for recognition for van Niekirk’s Agaat [For an earlier interview with the translator see here] it’s been nothing but gratifying to see fellow publishers and members of the writing community -- from the extraordinary agent Isobel Dixon who got us all going, to amazing translator Michiel Heyns, to Tin House’s Rob Spillman, a longtime champion of African writing, to the wonderful Tin House publishing team to PEN to yes, Anthony Appiah and Toni Morrison -- come out to support an undeniable talent. Their efforts are a reminder of the passion and generosity that drives the best of literary publishing. But I’m also reminded of the daunting amount of publicity it takes to get an unknown author even a modicum of recognition in this country. My own faith in “word of mouth” or other reliable forms of publicity has weakened as literary publishing itself has lost ground to more reliable forms of bestsellers. But my faith also hasn’t been so diminished that I wasn’t determined to write about Agaat and this remarkable panel. I hope you’ll read the book. You may like it not. You may not. I’m fairly sure that you’ll feel something. And I guarantee that you’ll be exposed to an extraordinary intelligence that captures through just a few deeply-etched characters some of the most provocative and important aspects of the 20th century. And if just one reader is converted, perhaps that’s enough. If you have thoughts on how publishing could do a better job of introducing international authors, please do let me know in the comments below. Blog posts? Attempts at attention-getting humor? Bullying (joke)? Readings? Great blurbs? What do you think? 8 Responses to "Beloved and Unknown: Adventures in Marketing an International Masterpiece"
I am african who writes literary african fiction and to see this sort of enthusiasm for international literary works does my soul plenty of good. Like you, i find the current profit mindedness of the industry disheartening and I am almost resolved to sidestep the industry and self publish. Still though, it doesn't get better much better than this, when the industry operates on passion for the written word and supports deserving authors. When the industry allocates resources to works like these the same way it does to its profit leaders, the public takes notice (assuming the work is great). No special marketing or publicity is needed, just full involvment from the industry. When the industry is not in this excellent mood though, it's a daunting task to get any kind of publicity for works like this. Here lies the essential problem of authorship when "distribution" is not interested. Self marketing or publishing a work of international literary fiction is about as foolhardy as investing in a car that runs on cheese (i'll let you know how it goes hehe). Still though, one can only hope in the power of word of mouth, despite its failures. Thanks Mayowa. Great to hear from you. I agree that resources (especially spare resources) are crucial to the effective publishing of books. Right now, many publishers are operating without the cash cushions of several years ago and while first quarter 2010 profits are up from a dismal 2009, numbers at many companies--with a few notable exceptions--are down from 2 years previously (2007). So while there are times when it's easier to take money from guaranteed bestseller Paul to help pay for the marketing of literary Peter, now is not necessarily one of those times. And that does affect both the mood, the possibilities for a real marketing push, and probably the general temper of my own post. I love the image of a car running on cheese, a favorite food. It would be another post to take on the complexities of self-publishing. I'll definitely look forward to your account of your experiences. Call me a bitter literary (don't forget unpublished) writer but i don't feel much sympathy for the industry (counter productive I know). Certain industry wide behaviors have lead and continue to cause this gradual destruction of the industry. Sure the recessions bad, but we've had those before. Instead of a balanced approach across genres or even within a genre, the industry darts from one hot trend to another with it's hair on fire (I talked about this in a post I wrote on the death of YA). The midlist and other genres suffer while the industry focuses on the ultra targeted niche and overwhelms the demand with supply (sending the genre back to the little leagues) until no one really cares anymore. See now uncool genres like chic lit and memoir. In the midst of these frenzies, the industry allocates enormous resources to hot genre at the expense of the midlist (see six figure advances for yet another YA paranormal). The frenzy also hurts the artform and devalues literary culture because of the amount of homogenous works that flood the market. The gatekeepers of literary culture are allowing unlimited (relatively) numbers of one kind of work to flood the market and restricting access for others. I haven't even started about the numerous terrible policies that are baked into the traditional publishing structure like the devils discounting with booksellers, or the exploitative state of the publisher/author relationship. How many times have you heard someone say the industry is broken? A whole lot but still the industry continues in its old crusty way. I feel better when i read stories like the one above, maybe profit hasn't completely molested a passion for books in the industry. Maybe. Its going to be a thinker when I do get an opportunity to be published traditionally because i'm not convinced its the promised land of authorial distribution. Lest it appear that i am only disgruntled with the industry, i will mention that i am just as disgruntled with the writers that cater to this frenzies. Why are there suddenly so many paranormal YA writers? The more I learn about the industry, the less I am enamoured of it. Writers don't have much of a choice other than the jungles of self publishing but even that is getting more appealing by the day. Mayowa, so far I have found that self-publishing is a daunting uphill struggle. Sometimes I think it must take an enormous amount of advertising money to even get noticed, but I hope I'm wrong about that. I wish you all the best, whichever avenue you choose. And bookstore placement, Bill. It's pay to play and that's just fine with everyone. Gilbert Sorentino's posthumously published book couldn't even get on the table downstairs at the Union Square Barnes and Noble. We treat our own literary masters like Chinese calligraphers trapped in the nightmare of the so-called cultural revolution--impoverished and disgraced. It's so sick! Why do we put up with it? Last time I looked I didn't have a Jesus complex, but I was in a Border's last night and it was all I could do to repress the urge to knock a towering stack of Laura Bush's screed over and cry: "Get these out of here! Do not make My Father's house a house of merchandise!" We shouldn't even be having this endlessly stupid conversation. We should be organized to facilitate the discovery and promotion of good works. Period. The end. Color me aghast. I'm really torn about it. It is inspiring when I meet folks who in the thick of it (like you I presume). It takes serious cojones to weigh all the challenges of self publishing and still do it. Once i conquer my fear of those challenges (and find some solutions), i'm all in. I feel your pain, I do. It's the way of the world no doubt, sure doesn't make it right though. My own take on self-publishing is probably closer to Bill's. It's an easier process for authors with already established platforms and/or for those who really enjoy and/or have the resources for a great deal of self-promotion. But it's very hard to substitute for the push that a major publishing company can put behind a book. It's hard to substitute for even the minor push. (If there's no push at all, it's harder to judge which way is better.) And this isn't just about marketing and advertising. It's also about favorable terms of distribution, placement, publicity, editing, etc etc. For some authors, however, self-publishing has been a very rewarding experience. J A Konrath, a thriller writer, has been blogging about this for a while and it might be worth checking out some of his posts. http://jakonrath.blogspot.com/ Bill, I'd love to hear more about your own experiences. Frances, I hear ya. Suggestions welcome! after nearly 90 "thanks, don't call us we'll call you" responses to queries and attempts to find an agent and follow the traditional publishing route, I opted for joint venture publishing with Eloquent Books. This has been more than a little disappointing, because although they promised all kinds of marketing, at the end of the day you only get what you're willing to pay for. It's not quite vanity publishing but boy it comes a close second. No doubt about it, I still believe that traditional publishing Houses, with access to e-marketing and publishing outlets are the way to go. As someone said - no way can you match the push that a big house can give to your book. trouble is, as a new entrant, without an introduction, a sponsor or some kind of entree, how do you get out of the slush pile?